Located at the foot of the Dents du Midi mountain range in the Alpine village of Les Cerniers, Switzerland, Whitepod is a hotel that offers a unique experience in the heart of the Swiss Alps. 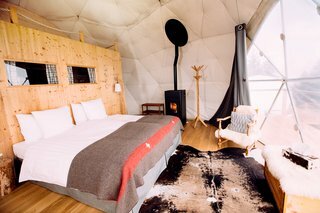 Set up away from the crowds at an altitude of 4,593 feet, Whitepod is an eco-luxury hotel and Alpine experience that includes 15 geodesic dome-shaped tents, which serve as individual guest rooms with the comforts of a traditional hotel. 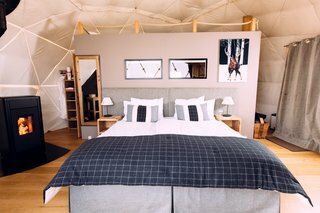 Designed to be both eco-friendly and luxurious, each pod is equipped with an efficient pellet stove, organic luxury bedding, a private bathroom, and a large terrace to enjoy the stunning Alpine views. The color of the pods is adapted to fit each season: white in the winter and green in summer. Upon check-in, guests receive their very own backpack with a map, headlamp, and walking sticks to ensure a full Alpine experience. The pods are located an easy 15-minute hike from reception—so, packing your hiking boots is essential. 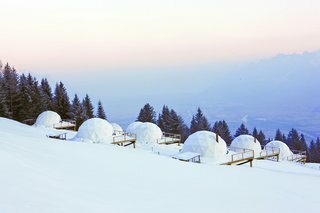 In addition to hiking, Whitepod also offers dog sledding, paragliding, and and private ski slopes for Whitepod guests only. 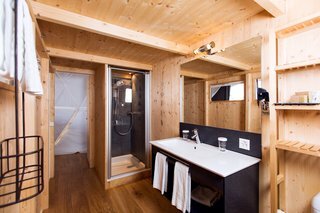 After skiing, guests can enjoy Whitepod's sauna, indulge in spa services, or dine at their in-house restaurant called Les Cerniers, which serves a selection of seasonal traditional mountain dishes. Whitepod lets you live a unique experience on a preserved piece of land in the Swiss Alps. 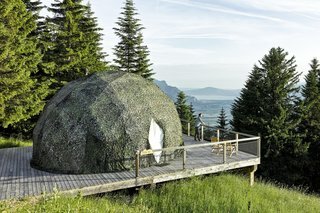 Since opening in 2004, Whitepod has aimed to prove that hospitality and environmental conservation can coexist to create a unique experience. By staying at Whitepod, guests play an active role in the resort's ecological mission. The use of energy and water is controlled, waste is recycled, local and regional ingredients are used for meals, and the staff members live nearby and walk to work. 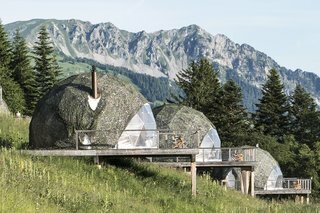 The pods are built to blend into the landscape of each season—white in the winter and green in summer—and can be dismantled so that nature can take its course, leaving little trace of the hotel behind. All the pods are equipped with organic luxury bedding and efficient pellet stoves, which add to the cozy interiors. 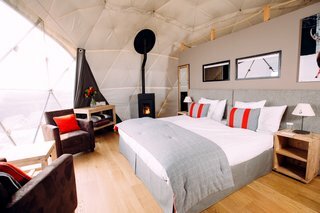 Whitepod currently offers 15 pods in three different configurations, and each sleeps two to four people. 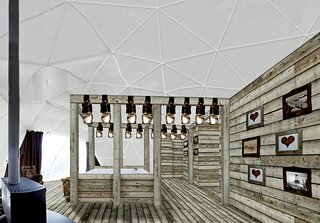 The interior decor is inspired by a modern glamping lifestyle. Each pod is conveniently equipped with a complete bathroom. In December 2017, Whitepod will launch three themed Pod Suites, each with their own private sauna. 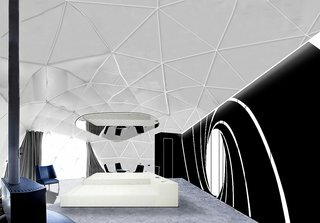 The "007 Pod Suite" will feature a sleek design, high-tech equipment, and a "Bond girl"-inspired, king-size bed. 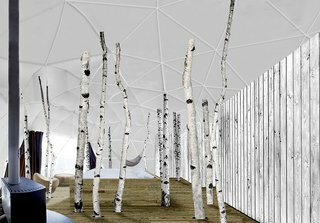 The "Forest Pod Suite" will be like spending the night in a luxurious birch forest surrounded by nature. Guests will be able to enjoy a hammock or a cozy king-size bed that resembles a nest. The "Swiss Pod Suite" will combine design and authenticity to give guests a full-on Swiss experience. 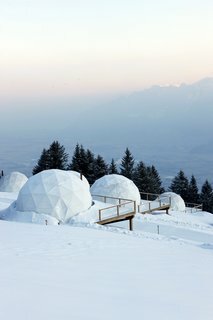 The geodesic domes look like igloos in the snowy Alpine landscape.